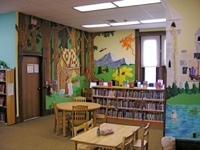 Occupying half of the third-floor of the Coldwater branch, Kids' Place is an area where children may learn and have fun. We have regular Story Hours for children ages 2-5 and ages 6 months-2 years. Please see our calendar for details. In addition to a diverse selection of children's books, magazines, and videos, Kids' Place also has a variety of board games, a craft table, and 6 computers with Internet access, filtered at an appropriate level for children.